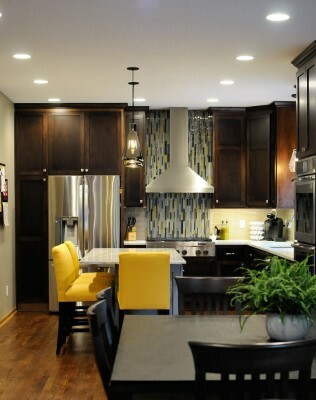 Kitchens frequently serve as the heart of the homes that we live in. They aren’t just an area where meals are cooked and eaten; they are also the place where family memories are created, meaningful conversations occur and lifetime bonds are established. B² Design Build is a professionally bonded and insured home renovation and remodeling company that offers updates and complete kitchen renovations for clients in Minneapolis and St. Paul. Our knowledgeable and customer-service oriented staff can help you enhance the functionality and appearance of your kitchen. We can create a kitchen designed specifically to meet the needs of your family, no matter the amount of space or budget involved. We realize that kitchens frequently see the most activity in your home. We always incorporate your daily routines as well as your social activities while planning the renovation of your kitchen. When planning your remodel, we take into account that kitchens are often the nerve center of homes and it’s usually the place where electronics are stored, keys are hung and daily routines are established. We incorporate functionality and inspiration into the designs that we create for our clients. Considering all of the small details that make up the whole component of your kitchen is one of our specialties. We recognize the important nature of the layout of your kitchen and work to ensure that all of the space that you need to prepare meals, eat and entertain is considered. We also recognize that storage is an important aspect of planning your kitchen remodel. We will create a kitchen that makes every inch of space work for you. Contact us today at 651-333-9394 or via email at info@b2designbuild.com to start the process of remodeling your dream kitchen today.